BANGI, 10 November 2014 – Open disagreements and dissent in Malaysian society proves that the country today is more democratic than during British colonial times. Honorary President of the Perdana Leadership Foundation Tun Dr Mahathir Mohamad said Malaysia’s democratic institutions allowed for differences of opinion and disagreements but there are limits to the freedom that can be practised. Opening the National University of Malaysia’s (UKM) 5th International Conference of Social Sciences and Humanities (ICOSH-UKM) 2014, Tun Mahathir said the country has been relatively stable despite having communal tensions. In his speech on the theme of ICOSH 2014; Civilisation, Hopes and Discontent the former prime minister said that part of the democratic process is to have disagreements on policies. He said during British rule there was no democracy and the people could not openly express dissent with the colonial government which introduced the Internal Security Act (ISA) in 1948. But as an independent country, open dissent was allowed even with the ISA still in operation with the sceptics continue to have their rights. “The government is struggling very hard to ensure stability and we are still living in a relatively stable country. We are civilised, we have laws, values and dialogues. There may be differences in understanding but we do not go to war,” he said. On settling disputes, he said that there is no one-size-fits-all solution to resolving disputes but negotiations and arbitration are the best way to settle them, not war. He said that the last resort of settling disagreements should always be done through the courts, such as the International Court of Justice. Once a judgement has been made all parties to the dispute should respect the decision. Although not everyone will be satisfied the decision should be accepted by even those who lost their case. 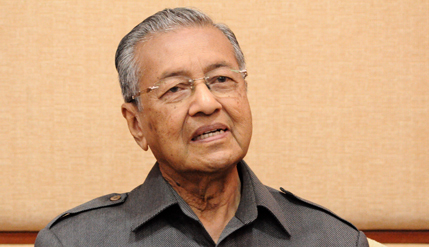 Dr Mahathir said that there is a price to pay for Malaysia’s experience in managing a multi-ethnic society. “Civilisation gives us hope living in a stable society but there are sacrifices. The laws are there and the decisions made may not be to one’s liking,” he said. Tun Mahathir also launched a new system of publishing the papers from the four-day ICOSH-UKM 2014 in the form of an e-book replacing the previous method of printing hard copies. It was set up as part of the National Book Policy. The e-books will be made available after the conclusion of the conference this Thursday. It was organised by the Faculty of Social Sciences and Humanities (FSSK). Also present at the opening was UKM Vice-Chancellor Professor Datuk Dr Noor Azlan Ghazali, FSSK Dean Prof Dr Hazita Azman, Deputy Dean (Research and Innovation) Prof Dr Mastura Mahmud and ICOSH-UKM 2014 Director Assoc Prof Dr Wan Amizah Wan Mahmud.